Taylor Fladgate's old Quinta da Terra Feita vineyard produced a 2005 vintage port wine that expresses a thoroughly sensuous hedonism and together with a certain earthiness. Here the dense blackberry and cassis is overlaid with herbal aromas, liquorice, tobacco and tar. On the palate it is thick with tannin yet sweet and medium-bodied. An impressively deep wine with a long finish that is still maturing. 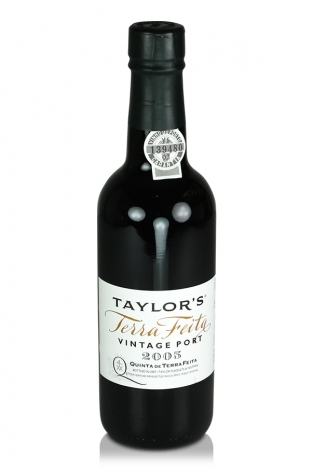 It is the close harmony between the fruit of this vineyard and the Vargellas vineyard that produces the legendary Taylor's vintage ports. The single quinta bottlings are traditionally released in years when a Taylor's vintage is not declared, are strictly limited to very small quantities and consequently highly sought after. They are released to market when ready to drink but do continue to develop thereafter. The port house of Taylor, Fladgate and Yeatman, to give it its full name, has a venerable history dating back to 1692 when merchant Job Bearsley began shipping wine back to England from the Douro Valley. This business would eventually evolve into one of the most respected producers of vintage ports. The Quinta da Terra Feita, in the centre of the original demarcated port region (1756), has a history of supplying grapes for Taylor Fladgate's vintage ports and was finally purchased by the company in 1974.